We pride ourselves on being different for a reason; when you visit our stores, you Shop differentli. Our products are on-trend, hand-picked and tested by our ALDI Test Kitchen to ensure they meet or exceed standards. We use these criteria to evaluate our merchandise and determine which limited edition items will return to shelves. During the fall, we bring special seasonal products back to stores and introduce exciting new products. These goodies are available during the fall and winter months to help you celebrate the changing seasons and prepare for the approaching holidays. Now that fall is finally here, we’re excited to give you the top ten pumpkin products to add to your grocery list! Nature’s Nectar Sparkling Pumpkin Cider ($1.99). Apple cider usually gets all of the attention, but this unsung hero is full of carbonated pumpkin goodness! It is delicious on its own and is a great base for festive mocktails. Cure your pumpkin craving with this spicy and protein-packed hummus. 1) To start, rinse your canned garbanzo beans and put them in a saucepan covered with a few inches of water. Bring the mixture to a boil. 2) Once the mixture is boiling, lower the heat and let it simmer uncovered for about 20 minutes. 3) Drain the beans and then pull skins off, if desired, for an even smoother texture. 4) In a food processor, combine the pumpkin, yogurt, syrup and spices. Pulse until well mixed. 5) Add the garbanzo beans and process until everything is creamy. 6) Let everything cool so you can serve! Barissimo Pumpkin Ground Coffee ($3.79). Combine this coffee with the holiday baking spices to create your own pumpkin spice latté at home! If you want to have dessert with your latté, check out this coffee brownie recipe. Simply substitute the Specially Selected coffee with pumpkin coffee to give it extra sweetness. Millville Pumpkin Crispy O’s ($1.99). This is one of our new 2018 seasonal products! Breakfast has never tasted better. If you are looking for a unique way to eat this cereal, try the Pumpkin Crispy O’s in these Crispy Oat S’mores Bars.The cereal can also be tossed into a party mix with Baker’s Corner chocolate morsels, Choceur Pumpkin Spice Pretzels and Southern Grove Honey Roasted Peanuts. 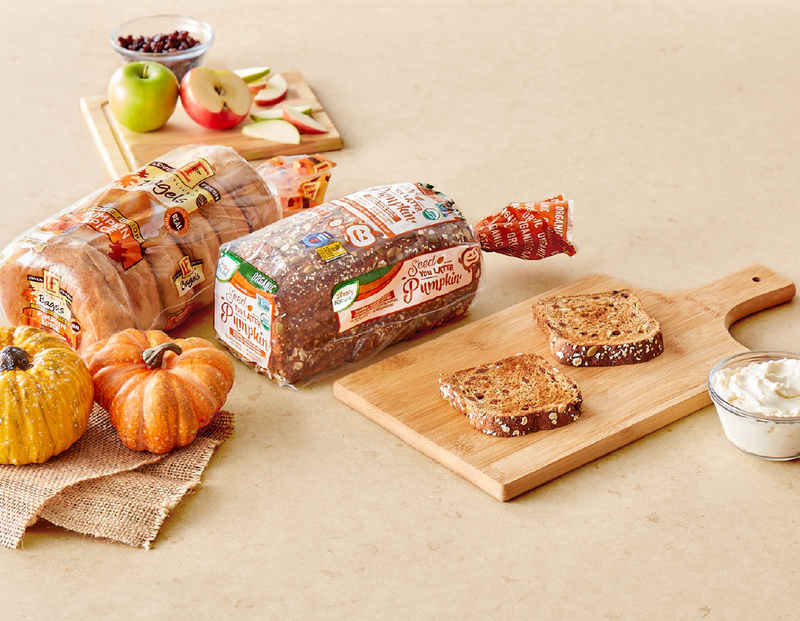 Our seasonal organic pumpkin bread gives toast a tasty edge. SimplyNature Organic Whole Seeded Pumpkin Bread ($3.99). As with any of our SimplyNature products, this bread is free from any added artificial ingredients and preservatives. (For a list of the full ingredients you’ll never find in SimplyNature products, visit our website). We can’t wait to use it for grilled cheese! Happy Farms Pumpkin Spice Cream Cheese ($1.65). For an easy snack, spread this cream cheese on the Organic Seeded Pumpkin Bread. Top with sliced apples and a handful of raisins. SimplyNature Organic Pumpkin Flax Granola ($2.69). Top your yogurt with this granola for a beautiful, hearty breakfast. It also pairs well with the pumpkin coffee! Choceur Pumpkin Spice Pretzels (will be in stores 10/3 for $1.99). Bring these treats to tailgate this fall. 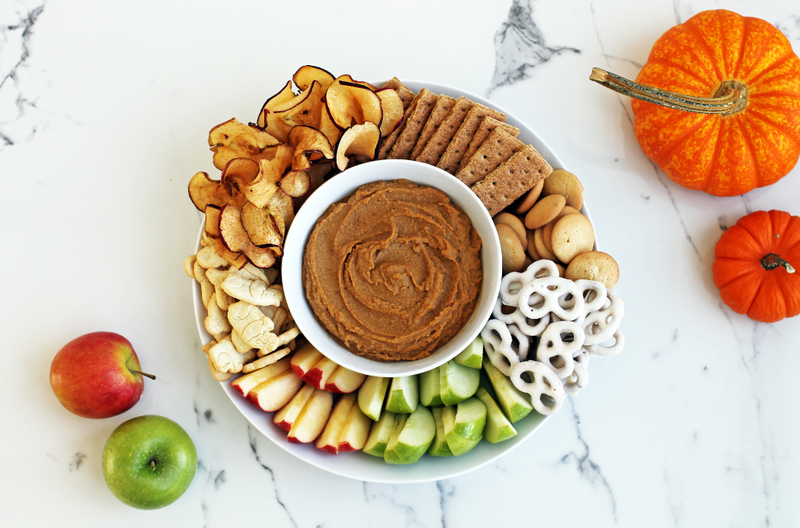 If you plan on staying-in, supplement your fall cheese board with these snacks or sprinkle them atop your homemade caramel apple. 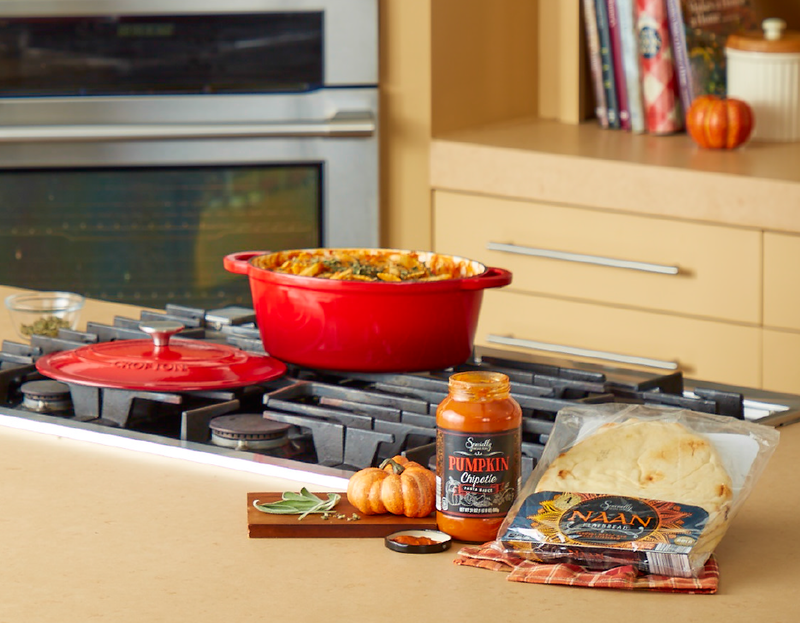 Specially Selected Pumpkin Chipotle Harvest Pasta Sauce ($2.49). This jarred sauce is ready to heat-and-serve over your pasta of preference. Prepare this pumpkin pasta to transition your family into fall. Pumpkins!! Maybe we’re cheating a little by including the squash itself, but we sell pumpkins September through October. There is nothing like having the real thing at your house for decorating, cooking or carving. Hopefully this post has you looking forward to all of the enjoyment fall has to offer! Let us know in the comments below which of our pumpkin products you plan on purchasing. Also, look for a future blog post this fall that will give you more recipes for apples! *Items are seasonal and in-store for a limited time. Love Aldi. Just wish you would bring store brand multi-grain cheerios. Hi, Elizabeth. We appreciate the shout out, and we will send your feedback to our buyers for consideration. The organic pumpkin bread is the best! It is so good toasted with cream cheese. It would be a great item to carry year round. We appreciate the feedback, Jen. Hi, Jen! We love your comment about our pumpkin bread, and think other customers would find it helpful, too. Can we have your permission to use your comment in future ALDI promotions and on our website? I give Aldi the majority of my business. When I find your are out of my product I expect to be compensated for buying your more expensive products. Give me the 1.50 bread for my usual .85 cents Split Top Wheat if you’re out. Further more. I do not appreciate being told how unfair the world is when this service is refused to me. This is how your lose customers. The world isn’t fair? Would you be saying that to yourself if I was your boss and I fired you? Because that is exactly what i would do if I were your regional or district manager. Your store in question is Aldi on Lake Street and Hiawatha Avenue in Minneapolis Minnesota. Get back to me IMMEDIATELY or lose my business. Roman- this is an insane request. If they’re out, they’re out. If you go to buy a car and the cheaper one is sold out, should they split the difference on the high end car? Your logic makes no sense whatsoever. Really? Because cub foods does this for me all the time. This issue was two weeks ago. Did you forget or choose not to read the above responses. If your not going to be constructive then sod off. No other grocery store will give you the more expensive bread for the price of the bread that is out of stock. Why would Aldi be any different? You look foolish complaining. Roman, are you seeing a different ad or going to a different Aldi? Aldi products are limited…you snooze, you lose. I don’t go on Friday or Sunday and figure they are going to have everything fully stocked the way they do on Monday or Tuesday. They have the best produce around and I live in South Florida with access to a lot of fresh produce. Thanks ALDI…we couldn’t be happier . I love so many of your seasonal products. I just wish most could be in stock year around! Like the Swiss cheese crackers. Emmentellars and Gouda cheese bites! . Soooo good! The pumpkin bagels and pumpkin cream cheese was gone before I could get to the store! I would love to see your great frozen holiday pies back again. The peppermint whipped cream pie is so good. Just like the one from bakers square restaurant. Your pecan and fruit pies are great too. I’m happy that you carry green tea and peppermint tea bags all year now! We love all your soups and sauces and chili and can meats too. The pizzas are fantastic! I’m just hoping Aldi continues to have such great food and to save on my grocery bill. We appreciate your feedback, Kathie! We’re glad you’re enjoying it, Emily! Hi I have been to the Aldi in Wilmington, Delaware and there was no Sparkling Pumpkin Cider or Pumpkin Spice Pretzels there. Are some stores not going to carry these products? I will have to agree with Mo and Stephanie B. Yes, this request of yours’, Roman, is from the perfect world we would like to live in. Let’s not slam Aldi for performing as a money making profitable business, which they should continue to do if they want to stay in business. Yes, I am disappointed when I go to Aldi for a specific item and they are out, which happened to me today. I will check out some of the other Aldi stores close by to see if they have stock of these 2 items, the women’s waterproof high top boots and the battery operated candles with a timer. These will make great Christmas gifts. I could go on and on about your products, but I will refrain due to your time and space. Thanks to you, Aldi, for keeping your prices as reasonable as possible. I really like the pumpkin flavored products, and I am looking foward to all the Christmas goodies from Germany. Although I know the answer to this, I’m going to say it anyway: PLEEEEEASE carry more German products throughout the year, instead of a few “special” weeks here and there. Thank you. I have yet to see pumpkin pies this year! They are delicious. These should be showing up in to stores soon! Hi, Cecelia. We don’t have this anymore, but we’ll let our buying team know you’d like to see it year round. Thank you for the Harvest and Pumpkin bagels! They are amazing! I would love to see more seasonal flavors like these. How much longer will they (and the pumpkin cream cheese) be in stores? We’re glad you like them! They are seasonal and should be available until early February. I checked three different Aldi’s early December, and they were all out of the pumpkin and harvest bagels for the season. Only one happened to have flavored cream cheese. I was super disappointed to discover that they do not have them until February! fact fine information for visitors. hard work. You should keep it up forever! bloggers publish only about gssips and web and this is really annoying. I think this website has very wonderful written written ccontent content.